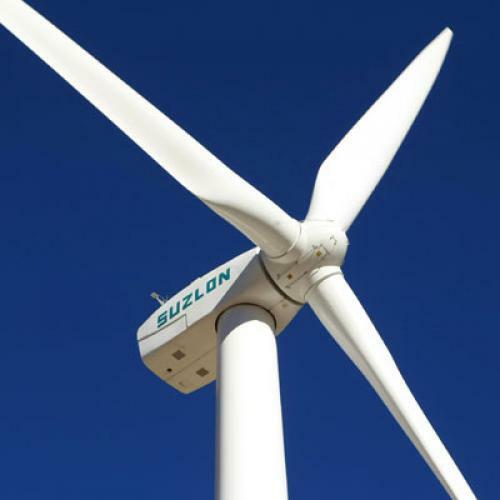 Will Rooftop Wind Turbines Ever Catch On? Does rooftop wind power have a future? Preston Koerner reports today that four new wind turbines are going up atop a 22-story building in downtown Portland. At first glance, it doesn't sound like a great deal: The turbines cost $40,000 in all and will satisfy just 1 percent of the building's electricity needs. But the developers at the helm of the project say they're mostly just interested in testing out the concept at this stage. In theory, rooftop wind has a ton to recommend it. 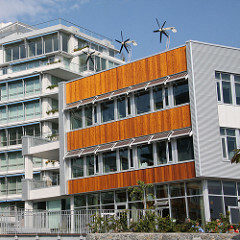 Most electricity in the United States is gobbled up by homes and buildings, and wind turbines are often cheaper than solar photovoltaics, so if cities could stick turbines on top of their factories and office buildings, they could generate a fair bit of carbon-free power without having to worry about costly (and highly inefficient) transmission lines. No wonder Michael Bloomberg has been suggesting that New York put up turbines all across the Manhattan skyline. Alas, it's not quite so simple, as this report from Building Green makes clear. Wind at high altitudes may be faster, but it's also a lot more turbulent, whereas turbines need "a strong laminar flow" to work effectively. (I had to look it up, too.) Meanwhile, smaller turbines, which is what rooftops would require, are much less economical than the very large behemoths found out in the countryside or on wind farms. On top of that, the wind turbines give off an annoying hum and emit vibrations that can rattle a building. And on top of that, it's not totally unheard of for a blade to shear off, which, while very rare, would also be problematic in an urban setting. Still, it's an intriguing idea, if only the kinks could get hammered out. According to the Times, the Portland architects have enlisted NASA researchers to map out weather patterns, while filling the turbine masts with sand to dampen out the rattle and hum. Onlookers doubt that the endeavor will ever prove worth the cost, but why not give it a shot?